Quantum Insights invented a novel way of revealing structures hidden in big, complex sets of data. Its challenge was to develop a GUI capable of displaying the animations that make the algorithm easy to use and, at the same time, support the complex underlying mathematics. It used the symbolic computation tool Maple, and because of the way Maple’s interface works, Quantum Insights was able to quickly get a proof of concept in a matter of days, using interpreted code. In addition, they also successfully replaced the interpreted code with compiled code to make it possible to handle large datasets with the requisite speed. Finally, they were able to prototype the approach using Maple’s threads package. Marvin Weinstein, the CEO of Quantum Insights will explain and demonstrate this novel approach in this webinar. Dr. Weinstein is a theoretical physicist who worked at the SLAC National Accelerator Laboratory at Stanford University for 42 years. He specialized in non-perturbative methods in quantum field theory. His ground-breaking research in this area led to the development of a quantum mechanics-based method for mapping the density of data. After being granted three patents related to the application of these quantum techniques to data analytics, Marvin retired from Stanford SLAC in 2013 to found Quantum Insights, a company at the cutting edge of precision medicine. Quantum Insights' algorithms are built into a proprietary library called that Maple calls. Dr. Khan graduated with a degree in Chemical Engineering from The University of Nottingham, and completed a PhD in Fluid Dynamics at Herriot-Watt University in Edinburgh. He has played several key roles in selling, supporting and marketing math and simulation software during his professional career, and has also consulted in thermo-fluid modeling and energy simulation. 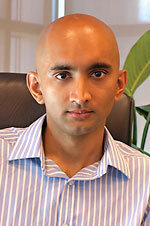 Dr. Khan is currently the Product Manager for Maple in professional markets. Attendance is free. To access the event please register.